Even well maintained boats will eventually need their deck and cockpit seats reupholstered. 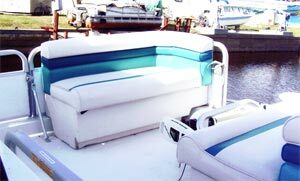 New custom upholstery will help your boat look like new again. Most marine canvas shops can custom upholster your cockpit and deck cushions, saloon cushions and backs, v-berth and stateroom cushions and mattresses, sofas, chairs, or anything else that needs upholstering. They also perform sailboat sail repairs, interior and exterior upholstery, framebending for bimini tops and more, using all stainless steel fittings, Sunbrella canvas, and other top-quality materials.